Cleaning a litter box is one of the most unpleasant household tasks around. Thankfully there are self-cleaning litter boxes, so those of us who really can’t deal with cleaning up every day have an alternative. Like a lot of other electric devices, the technology is improving rapidly on these products, so the noisy difficult to use self-cleaning boxes of the past are being replaced by much quieter and more efficient designs that work better than they ever did before. If you have been shopping around for one of these fantastic helpers, we will give you the low down on what you need to know. If you lose power, it won’t work. The PetSafe ScoopFree Ultra is a hooded, self-cleaning system that works by automatically raking waste into a covered compartment every 5, 10 or 20 minutes after your cat uses it (it also has a button so you can manually control the raking it need be). Sensors detect your pet’s movement and reset the timer after each use. It features a health counter that tracks usage. 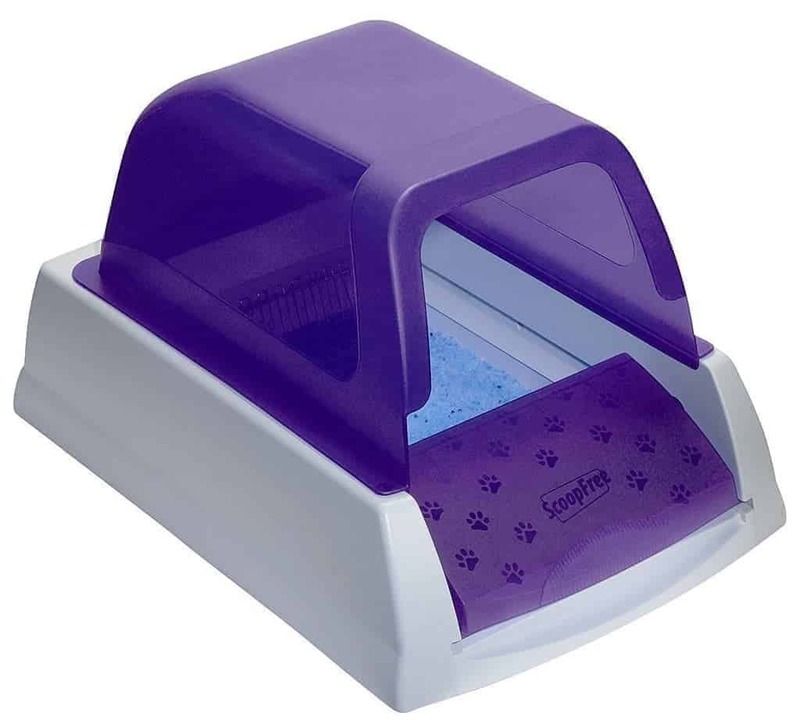 It comes with a crystal litter tray that is supposedly five times more effective at reducing odor compared to clumping options. You will have to change the tray around once per month for each cat at the cost of approximately $49.99 for a set of 3 trays (although some users report that you need to change them more often than that). One of the things that users really like about this system is that crystals do a really good job of odor control, and the process of swapping in a fresh drawer is quick, easy and clean. The cleaning cycle is pretty quick lasting only around 30 seconds, and the sound is very minimal. It’s incredibly convenient, and things are kept very clean. The cost of crystals refill tray is expensive compared with the clumping type, some users use a compatible plastic tray that they refill themselves, and that can help to reduce the cost. The CatGenie is a pretty unique product. You hook it up to sewage and water lines, and it flushes all of the waste away after it has been washed through washable granules. It comes with everything you need to make your home litter free. It is the greenest pet box around and probably the most economical since you don’t have to keep buying litter. 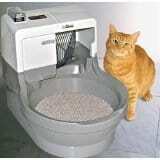 Reviewers recommend the Genie for pets who like having a clean environment. Users love that the washable granules that take the place of traditional litter work well and are much less expensive because of the reduced replacement frequency. One box of the granules last several months. It also reportedly does a great job or keeping odors out, and if you are worried about the environment, this is a great alternative. Some users complain that the system sometimes doesn’t manage to get all the waste out on the wash cycle, so when the heat dries the granules, the result can be a bit of a noxious smell. To stop this from happening, you should have it running after each use. 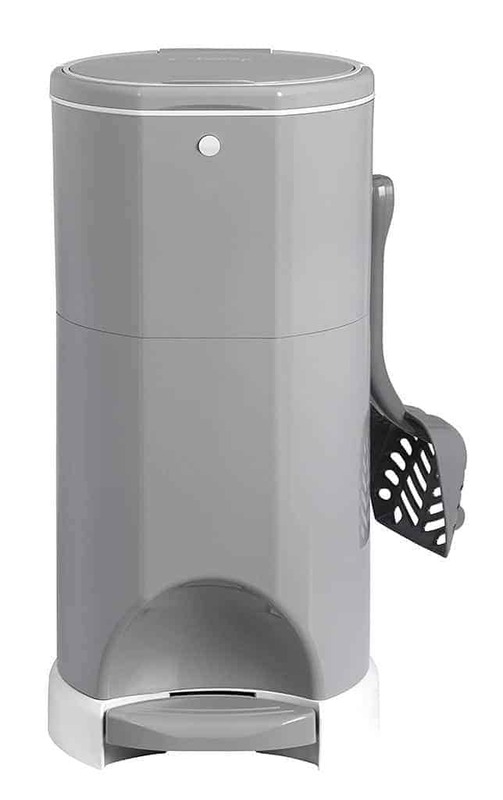 Easy to use – tilt to one side and dirty litter moves to the compartment that you empty into the trash. It is a good system for the price. 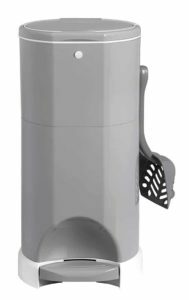 The design and the simple idea are great, but many users have had issues with poor construction mainly with the inside filter not fitting well. Also, the clips that keep the lid on easily move out-of-place, so when you roll the unit to filter, the side you turn it onto gets a gap, and clean litter slips through. You can fix some of the issues with duct tape and other DIY fixes but many users are not going to want to do this, but if you don’t want to spend $100s of dollars on a more expensive device the Omega Paw can take out some of the hassles of cleaning up after your pet. Price is the main selling feature of the Omega Paw as well as being very convenient, and easy to use. Many reviewers complain of flimsy construction and poor quality with litter often spilling out of the box, and the plastic insert is not very durable. The drawer that catches the waste when you roll the box tends to slide open mid-roll, so little fragments spill out. If odor control is your most significant reason for looking for a self-cleaning unit, you may want to check out the Litter Champ. It isn’t the self-cleaning system but rather a waste disposal system that makes dealing with the output a little easier. You use this system to put the waste in then let the container fill up (it has odor control), when it is full you open it up to remove the bag and throw the waste away. This system means that you don’t scoop and take out the garbage multiple times a week. It is very similar to the Cat Genie. The odor control and not having to make multiple trips to the garbage each time you scoop. Refill bags could be cheaper. If you haven’t used a self-cleaning system, you may be wondering what they are, and how they work. In the most basic form, self-cleaning products do the scooping for the user. Generally using a combing mechanism or a tilting motion these systems collect the waste and put it into a sealed compartment that the pet owner will have to empty at some point in time. Most models on the market have slightly different designs and ways of disposing of the waste; some rake the debris into a receptacle while others flush the waste into the homes sewage system. Most designs collect clumps and deposit them into a plastic bag or tray that the owner changes. The owner will still have to dispose of the waste (except for the CatGenie), but often you only have to do this once a week, or in some case once a month, not every day. They can help to keep things clean and fresh, and are especially useful for those finicky cats who cannot deal with a dirty environment. Pets who need clean area all of the time. Owners who strongly dislike touching litter. Owners who are short on time and find it difficult to clean the box as much as they would like. Owners who are finding their current box to be too smelly. Owners who are pregnant or have a weakened immune system and would prefer not to interact with cat waste. They are, for the most part, easy to set up, maintain and use, although there are a few things to keep in mind when shopping for one. Size– It is essential to consider the size of the unit when shopping around. Size is important not only if you have more than one pet, but also think about where in your house you are going to be putting the box and whether it will fit. You should measure your space, and think through what kind of size would work best in your area. How often will it need to be cleaned? These aren’t miracle products, and you will have to do some cleaning. With most automatic designs, you will still to need empty the waste compartment once every week and clean out the tray now and then. What you won’t have to do is clean it every single day. Nearly all the models available are quiet and discreet, and clear away the waste without making a lot of noise and attracting a lot of attention. How is the waste stored/trapped? In most models, the residue gets sealed in a covered, odor-controlling waste trap. Guarantees and Warranty– Many of these devices from the big name reputable brands offer, fairly generous guarantees and pretty good warranties. The standard warranty seems to be one year limited, while some of the guarantees include 90-day money back option. When to not get a self-cleaning box? These products tend to not work well with animals who have runny stools or diarrhea. Also so some products won’t work with cats under a certain weight (the kitten may not weight enough to trigger the sensor to clean after being used). Features vary quite a bit depending on the type of system that you choose. Here are some features to consider when shopping around. Privacy Hood – Depending on your pet’s preference, most models have an option to have a hood so your cat has some privacy and everything is adequately contained. 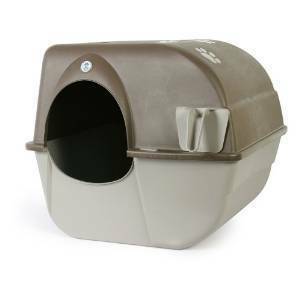 High Walled Design – In addition to the privacy hood, you may want to consider designs that have high walls if your cat likes to scatter litter. Programmable – Depending on your schedule, you may want to shut off the cleaning feature at night to avoid noise (although model models don’t make much noise at all). You can do this through a programmable element on some models. You can also generally program the number of times per day that the cleaning system will run. Motion sensors are used to determine when your cat enters and leaves the box on most electric self-cleaners; these are used for safety as well as to help determine when the automatic cleaning system will kick in. Battery backup– If you are worried about a self-cleaning system not working during a power outage, there are some models available with a battery backup (Littermaid and Natures Miracle both offer this feature). What products are best for the environment? Litter is notoriously bad for the environment, auto devices do allow you to use less, but if you are looking for the best option for the environment, you will want to have a look at the CatGenie that uses reusable granules that are washed and dried each time it is used. You may also want to consider using pine pellets that is 100% natural and chemical free and a little bit easier on the environment. Do they stop them from smelling? Generally yes, auto cleaners work better at keeping out any smells as they remove the waste and contain it in a closed airtight compartment. Why aren’t you supposed to use them for cats under six months? There is a couple of reason not to use them with a kitten. The first is that a young cat may not be large enough to properly set off the motion sensors that tell the box to activate and begin cleaning. The second is that the consistency of the waste of a kitten is usually much softer, making it difficult for the cleaners to work effectively. Yes, they are completely safe for pets to use. The big fear is obviously that the cleaning system will start while the cat in the box and your pet may be hurt or become terrified. The cleaning cycle will never begin with an animal still in the unit, as they all have sensors that can tell if the device is empty or not. That is why you need to make sure your cat reaches a minimum weight/age requirement before using. How do you get your cat used to a new box? Most pets can adapt pretty quickly to a new box. To make sure yours does, place the new unit next to your old litter box. Do not clean out the old box. (Cats prefer to use a clean box, and the new unit will always be fresh.) If your pet is shy, do not operate the automatic cleaning feature automatically for a few days. Manually activate any automatic unit 2 to 3 times a day for the first 2 to 3 days, to let your cat get used to going into the litter box before you set it to clean automatically. As soon as your pet is acclimated to the new self-cleaning unit you can program it to clean automatically. Auto cleaning boxes can be much cleaner and much less smelly than traditional boxes. Some pets won’t use a box unless it is spotless every day, which can be a nuisance for pet owners who don’t have the time. Some owners may be pregnant or have weakened immune systems and would prefer to avoid changing or being near cat litter entirely. Not only are these devices convenient and easy to use they are great for helping to keep everyone healthy and happy. If you are one of the many people who hate to clean the litter box, you will most likely not regret trying out one of these auto cleaning systems. Yes, they can be somewhat pricey, but there are budget options available, and many users find that the savings in litter justify the high cost of some of these products. If you do decide to invest in a higher-end model, make sure you are aware of the return policy and if there is a money back guarantee available, in case you find that you end up with a device that isn’t right for you. Many customers have seen these machines can improve the quality of life and love that they don’t have to scoop anymore.